Madison Tapia’s (left) family feels the strain of the high costs of rent, most times feeling like it’s these high prices that keep them in the cycle of not being able to save up for a down payment on a mortgage. Madison and Luis Tapia say they feel trapped with regards to their housing options. They think that since Calgary’s summer flood, there’s been a lack of options when it comes to finding reasonably priced housing. “It’s just a lack of choice, and it’s cheaper,” said Madison, when asked why she chose to live in a basement suite. 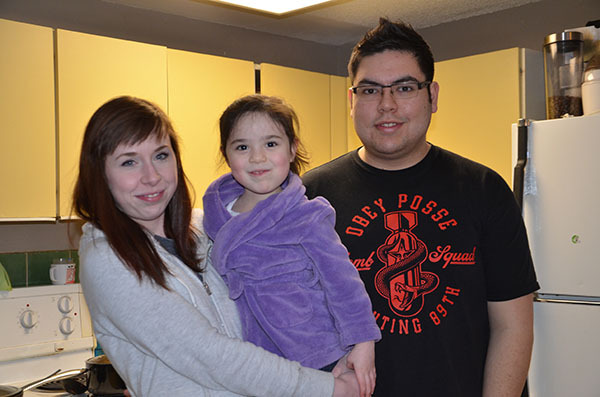 The couple and their three-year-old daughter live in a basement suite in the quiet urban community of Richmond located off of 26th Avenue in S.W. Calgary. Madison’s mother lives in the upstairs rental suite.